Waukegan, Illinois is one of the largest cities located on the west bank of Lake Michigan and is the presiding seat of Lake County. The city is known for its tourist attractions, harbor and airport and is the location of three superfund sites. Its historical ties to the manufacturing sector and involvement in the transportation industry attracted numerous immigrants over time and the city now boasts a rich and diverse population that is now approaching 90,000. Rosenfeld Injury Lawyers LLC knows the issues Waukegan nursing home patients regularly encounter. Our Waukegan nursing home abuse & neglect attorneys have experience litigating these matters in the Lake County Courthouse. When it comes to protecting the legal rights of yourself or your loved one, you can rest assured that our law firm will do what it takes to ensure the responsible parties are held fully accountable for their involvement. We invite to talk to our Waukegan nursing home abuse lawyers for free, confidential case evaluation. Of the 90,000 residents living in Waukegan, over 6,600 are over the age of 65 and seniors represent almost 7.5% of the total population. The city is home to numerous nursing facilities, which are mean to meet the needs of those who require a secure and safe environment. Seniors are able to involve themselves in numerous activities provided by the Waukegan Township Park Place Senior Center, which is operated by Catholic Charities. The activities provided include educational programs; health, wellness and fitness programs; social events and the opportunity to enjoy meals with friends and family. Over the past decade, the number of reported cases involving nursing home abuse has risen at an alarming rate across Illinois. In an effort to provide transparency and allow families to make well educated decisions regarding the placement of their loved ones in homes, medicare.gov now provides ratings on all accredited nursing homes and cites areas of concern to be taken into consideration. As more nursing homes become taken over by for-profit companies, less patients are receiving the quality of care and respect they deserve. Unfortunately, the nursing facilities will often ignore the needs of elderly patients until a Waukegan nursing home attorney intercedes on behalf of victims. Following are the accredited nursing facilities located within Waukegan, Illinois and their current ratings. Bayside Terrace has earned a four star rating out of a possible score of five stars. The primary concerns cited were its history of health inspection deficiencies. The average number of fire safety related deficiencies discovered per nursing facility in the state is 6.8 and 14 deficiencies were reported, lending concern to the facility’s fire safety policies. In addition, two environmental deficiencies were discovered. While this facility scores well on the quality of service it provides, these are issues that need to be addressed. Bayside Terrace has 168 certified beds, which qualify for Medicaid payments. This facility is unable to accept Medicare payments. Glenlake is one of the worst locations that you could expose a loved one to and will remain that way until it addresses the serious concerns that have been cited in its two star assessment. Its health inspection history is rife with violations and its 26 deficiencies greatly exceed the state average of 7.6. What is most concerning is how those deficiencies have been classified; two instances of mistreatment, four resident rights violations, nine quality of care deficiencies and four prescription medicine infractions. The facility has 265 certified beds, making it a larger home and a danger to a greater number of potential victims. The Lake Park Center is a typical example of how understaffing can result in neglect regardless of the training staff members have received. While the facility received a five star rating for the quality of services provided, its skeleton crew earned only a two star rating, which suggests that the issue is not in the training of the caregivers, but their inability to serve everybody. This could also be an influencing factor on the two star health inspection rating the facility earned— even though none of the infractions had anything to do with misconduct, the mistreatment of patients or the violation of their rights. Overall, Lake Park Center has received a three star rating and has 210 certified beds. The facility accepts Medicaid but cannot accept Medicare payments. Pavilion of Waukegan is another nursing home that is plagued by understaffing, which has impacted its otherwise positive accomplishments. Its staff level only received two stars while it scored four stars on quality of care and three stars on its health inspection history. Resident rights violations, mistreatment and quality of care were areas cited on its health inspection report, which suggests that staff members are capable of providing excellent service but unable to handle the needs of the entire patient population. This facility has 109 certified beds which qualify for both Medicare and Medicaid payments. The Terrace Nursing Home has received pretty average ratings across the board— for its staff size, health record and the quality of service provided. Its overall rating of three stars makes it simply an average home that could seek to make some improvements. Two reports of patient mistreatment have marred the home’s health inspection rating and an additional three deficiencies resulted out of environmental hazards. On a positive note, The Terrace Nursing Home has an impeccable fire safety rating. This facility has 115 certified beds and is able to accept both Medicare and Medicaid payments. What is important to understand about nursing home abuse is that the majority of the cases are not the result of direct acts committed by horrible people, but are rather the result of the inability of staff members to dedicate the amount of time required to make sure that everyone is cared for. For-profit corporations choose to increase their margins by keeping staff numbers at the lowest acceptable levels and this harms patients. The injuries that may result and evidence of neglect include the following. Development of bedsores. This occurs most often when patients with limited mobility are not moved regularly. Pressure is placed on the joints, which cuts the blood flow to the surrounding area and the surrounding tissue begins to die. All caregivers must do in order to prevent this issue is to reposition patients every one to two hours or to encourage the patient to walk or participate in physical activity if he or she is able. Learn more about pressure sores here. Dehydration or malnutrition. It is extremely sad when nursing homes are so understaffed that patients go unfed or without access to fluids. Unfortunately, this happens more often than you may believe. Trips and falls. Certain patients require more supervision than others and nursing facilities are required to assess whether each patient is at risk of experiencing a fall and then to put together a fall prevention plan. 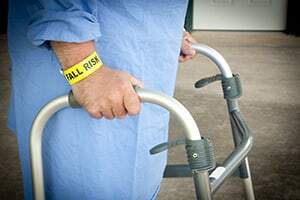 Many falls that occur in nursing homes can be prevented through supervision, but understaffed facilities are unable to dedicate the resources required to ensure that the risk of falling is minimized. Rosenfeld Injury Lawyers LLC routinely handles cases involving Lake County nursing home neglect and it is our belief that the most effective measure victims can take is to seek accountability from facilities that prioritize profit margins over the safety of human begins. If your loved one has been injured due to nursing home neglect or abuse, our Waukegan nursing home lawyers are willing to fight on your behalf to ensure that you are compensated well enough to provide him or her with a safe and caring environment. We do not merely have the access to resources needed to win your case, but can also help you locate a facility that provides excellent care. Contact us for a free consultation and we will review the immediate steps you need to ensure your loved one’s safety and then investigate the details of your case prior to letting you know what legal options are available to you. If we are unable to secure compensation on behalf of your loved one, you can be assured that our resources and services will come at no charge. The city of Waukegan is one of the oldest established communities in the State of Illinois and its first record in history occurs when Pere Marquette visited the area in 1673. It would become a French trading post in subsequent years and earn the name “Little Fort” by the Potawatomie Indian tribe that settled the territory. In 1829, the Potawatomie tribe gave up its claims to the lands as part of a treaty with the Federal government. The name Waukegan was created in homage of the name the Potawatomie Indians had given to it, which was Wakaigin in the Potawatomie language. In 1849, Waukegan received recognition as a town and began to attract settlers primarily due to its location on Lake Michigan. It has always participated in trade and would ship goods from all of the area farms to the city of Chicago. When the railroad gained steam in the 1850s, Waukegan was one of the stops on the Chicago and North Western railway. This gave the town tremendous value as a manufacturing center and attracted both residents and companies as a result. The booming population earned the town the right to incorporate as a city and it did so in 1859 when its land area totaled a mere 5.62 square miles. Waukegan has since grown to a sprawling city of nearly 90,000 residents comprised mostly of lower middle class families. Since the dawn of Waukegan’s history, the city has served as a cog in the transportation industry, from when it acted as a trading post to when it began supplying the city of Chicago with food and other wares produced by those in the rural lands nearby. Its location on Lake Michigan and access to the railroad turned it into a transportation hub and it continues to play a large part in modern transportation. It is currently home to a harbor, regional airport and three taxi companies. The city has access to Metra lines that run along the Union Pacific and those lines are capable of transporting travelers into downtown Chicago. Recreational boaters are able to make use of the marina at Waukegan Harbor and the harbor acts as a shipping center for ships delivering goods via Lake Michigan on routes to Green Bay, Chicago and Milwaukee. Some of the more notable companies that have established cargo facilities at the harbor include Gold Bond Building Products, St. Mary’s Cement Company and LaFarge Corp.
One of the drawbacks of Waukegan is that it is host to three federally funded superfund sites— which are locations where hazardous materials have been proven to cause a negative impact on the environment. The first site was created following the discovery of PCPs in the sediment of the Waukegan Harbor and Outboard Marine Corporation was determined to be the party responsible. It began cleanup efforts in 1990. Another site was the result of asbestos contamination discovered in 1988 and while the majority of the contamination was addressed in the three years following the initial discovery, current efforts are still underway to clean up asbestos found outside of the initial contamination zone. The third and final site is located at the Yeoman Creek Landfill, which allowed leachate to leak into the groundwater. This posed a hazard as a contaminant and volatile compound that could combust. Cleanup was completed in 2005. Waukegan is home to numerous tourist attractions and activities that draw in crowds on a regular basis. Its landmarks include the Genesee Theatre, Lake County Sports Center, Waukegan History Museum and the William D. Block Memorial library. The city is home to a number of events, including the Chicago Latino Film Festival, Art Wauk, Holiday Wauk and Fiestas Parade and Festival. These events cater to the diverse cultural interests of a melting pot society.